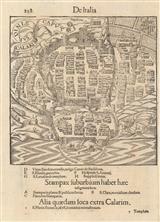 Description: Early city plan of Cagliari with key to buildings of importance. Description: Sardinia. Early black and white woodcut. 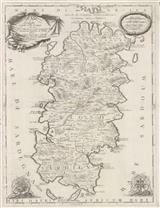 Description: Magnificent chart of Sardinia orientated East to West with an elaborate central cartouche. Description: Sardinia and most of Corsica. Original colour. Description: Sea Chart showing Port of Longo Sardo. Marked with navigational notes. 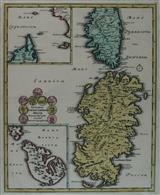 Description: Early French sea chart of Capo Carbonara at the southeastern corner of Sardinia. Marked with depth soundings and navigational warnings. 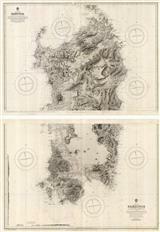 Description: Sea Chart showing Porto Longon. Marked with navigational notes. Description: Sea Chart of the Gulf of Caillery. 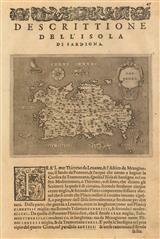 Description: Sardinia and the Kingdom of Sardinia-Piedmont. Two maps on one sheet. Original colour.